Freight charge includes convenient pre-paid return satchel. Labour TENS can assist you to have a natural birth by providing effective and long lasting drug free pain relief. Using Labour TENS in childbirth may help you stay calm and comfortable which reduces the possibility of medical intervention and further complications. We hire and sell advanced digital maternity TENS machines which are pre-programmed for labour & very easy to use. For effective pain relief it is recommended that you use Labour TENS from the first contraction through birth and beyond. Our Labour TENS machines have been used succesfully by thousands of women in Australia since we started hiring them in 2005. Many of these women have provided us with great feedback and wonderful stories which may be viewed on our blog. TENS machines have been used in the UK & Europe since the 1960's. Our TENS hire company provides quality TENS machines and related products, education support and customer service to help you have the birth you want at minimal cost. TENS machines can be used alone for a drug free birth or with hospital medications or any other natural pain relief method. Health fund rebates up to 100% when you buy or hire a TENS machine - dependant on your Health fund and cover. Heather has a background in nursing with specialist training in TENS for pain relief & is available for pain management consultation at the Lotus Centre. We also provide natural birth classes, hypnotherapy for childbirth prenatal yoga classes acupuncture and prenatal massage in the Northern Beaches in Sydney. Free natural pain management classes conducted on a regular basis. For more details click here. Figures obtained from customer feed back form included with every hire. Updated February 2011. Why use Labour TENS ? How does TENS work ? What does labour TENS feel like ? When do I start using the Labour TENS ? How long should labour TENS be used ? Can I practice with labour TENS ? When to use or not use TENS ? I would like a water birth - can I use Labour TENS ? Can I use a Labour TENS machine with other pain relief methods ? Can I use Labour TENS after the birth ? Can I use an ordinary TENS machine ? When is the best time to order ? What if I am due in less than 3 weeks ? Can I take the labour TENS machine into hospital with me ? What if my baby is late ? Can I use Labour TENS to treat back pain during pregnancy ? The Labour TENS unit is an advanced, small, battery powered device which sends a pulsed electrical stimulus via pads to the skin. Transcutaneous Electrical Nerve Stimulation (TENS) stimulates the release of endorphins & uses the gate theory of pain relief as researched by "Melzack & Wall". TENS machines have been in use since the 1960's and over the years have become smaller, portable and easier to use. A pleasant tingling sensation on the skin where the pads are placed. When do I start using the Labour TENS machine? 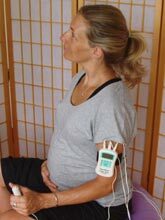 We recommend you start using Labour TENS at home at the onset of contractions. Early use of Labour TENS promotes the bodies production of endorphins and encephalins - the bodies natural pain killers. The TENS machine can be worn as needed for as long as desired but a minimum 30 minute duration is recommended for childbirth. Can I practice with the Labour TENS machine? Yes, we recommend you try out the Labour TENS machine beforehand so that you are familiar with the operation. You may place the pads on your lower back as you would during labour or you may place them on the inside of your forearm to test. If you are earlier than 37 weeks then limit the test to a short period (less than 1 minute). The pads are self adhesive and re-usable. Re-apply the plastic film to the sticky side of the pads when finished and store in the plastic bag. When to use or not use TENS? Labour TENS is specifically designed for childbirth. It has been tried, tested and in use since the 1960's. However there are a few precautions. Do not use over broken or desensitised skin. Do not use before 37 weeks unless approved by your doctor. Do not use if you have a pacemaker. Seek advice from doctor if you have epilepsy. Yes, although NOT whilst in the water. Use during the first stage of labour which may take several hours. The midwife will not usually ask you to enter the water after you are 5cm dilated. You need to REMOVE the TENS machine BEFORE you enter the water. Yes, you may continue using the Labour TENS machine with other methods such as pethidine and gas and air. 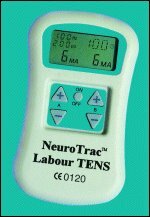 Can I use the Labour TENS machine after the birth ? Yes, Labour TENS can be effective for reducing the pain of uterine contractions after birth. 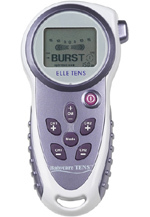 The Labour TENS machine can be used whilst breastfeeding after birth. It is not recommended as an ordinary TENS will be less effective and more complicated. Our Labour TENS machine uses larger pads and has two specially designed pre-set programmes with a boost button for changing between the two programmes. Order as soon as possible to secure your Labour TENS machine. It will be posted out to you to arrive by your nominated hire start date. We recommend you use the Express Post service (guaranteed next day delivery for most metropolitan area's) for $5 extra postage and packing. Can I take the Labour TENS unit into hospital with me ? Yes. The midwives and doctors are usually very happy for women to use labour TENS. Check with your midwife or doctor if you are unsure. You may need to turn the labour TENS unit off temporarily whilst using electronic monitoring equipment. Please phone the office as soon as possible. Click here for information about natural ways to induce labour. After 37 weeks Labour TENS can be used to treat back pain during pregnancy but only under medical supervision. Click here for more information. 'Just to be able to press a button to relieve each contraction was great. Also the ability to adjust the intensity and know that it can go higher was a huge relief. I found the Labour TENS unit the most convenient pain relief because you can take it anywhere and don’t need to undress.' Kas Volkamer. 'I found the Labour TENS machine easy to use and most effective - especially that wonderful boost button. I wanted to have a drug free birth and Labour TENS made this possible. Thank you so much' Cherrie Smith.